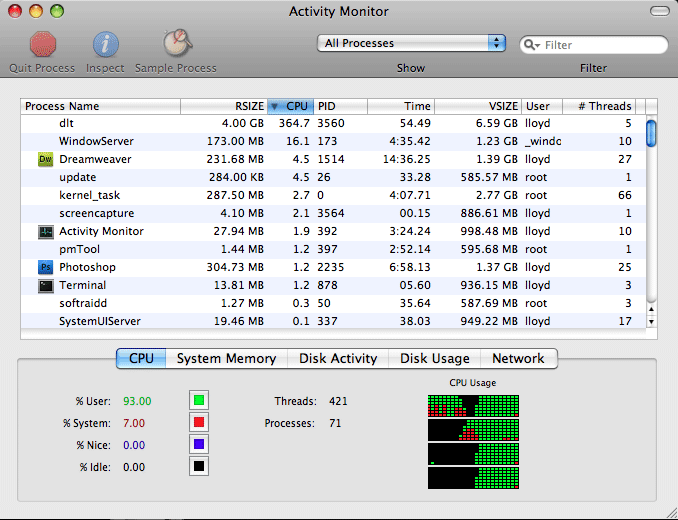 MAC OS X has an activity monitor which is very useful when we want to have information on things like CPU, System memory, Network activity and also info regarding disk usage. 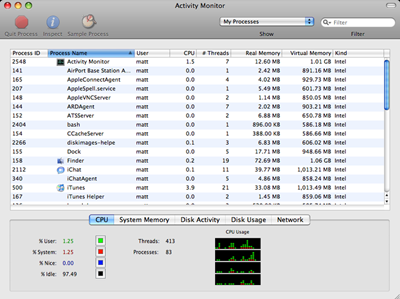 Activity monitor also has capability to view CPU history as well as disk memory and network usage. Ranging from i tunes to photo shop to Safari to dream weaver to even your personal mail, you can check on the parameters like CPU, R SIZE, V SIZE to parameters like PID on a single screen just like you see in Windows operating system like Windows Task Manager. As shown below you can see that at this particular moment the list of various programs is listed from which you can view all the parameters like actual memory usage of programs using activity monitor. Note that out of 16GB as shown above nearly 8GB of memory is being used in all by sharing of all the various processes. Starting programs, running commands, etc will basically increase the memory requirements. The Real Memory column is the one which matters the most as this is the parameter which actually uses the program space in the memory chips. The graphical user interface of the activity monitor is very helpful and simple. 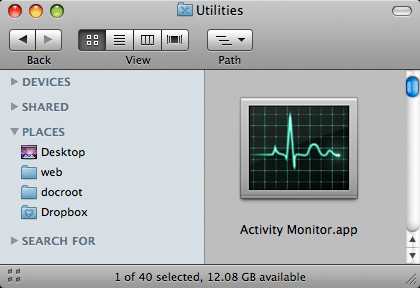 Activity monitor is in utilities folder under the applications. All you need to do is to just drag the same into the dock so that it is readily available. Many of the times we wanted to check on how much the program is taking most of the CPU time; simply the activity monitor gives the info on various processes and information. You need to choose All Processes which is in the pop up menu at center. Control-click or right-click on the column headers to choose which all columns you wish to display. Note that the column names are only abbreviated when the window size is reduced. You can see from the tabs at bottom of the screen which shows other useful information. The whole screen can’t be viewed completely at a time but you can’t watch Disk Activity and Network at the same time on a single screen. As you can see that a history graph below can be seen by selecting Window and then by clicking on CPU History, history over quite some time can be seen easily. By clicking on View and then Update Frequency. 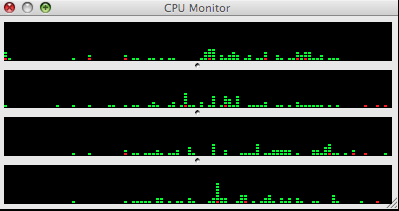 Black areas indicate idle CPU cores, Green represents CPU utilization by user applications, Red represents CPU utilization by Mac OS X itself, and Blue indicates low-priority tasks. The example below shows a mostly idle system. The display updates as specified, scrolling left at each interval from time to time. For a dual-core system, you’ll find two layers, four layers for 4-core-, eight for 8-core in the above graph. Sometimes, monitoring performance in Terminal can be very useful. The top and vm_stat tools (and iostat for disk I/O) can come in handy sometimes. You must use these tools in a Terminal window. The most useful tool is top, which can be left running continually, refreshing the window at regular intervals as shown below. Please note that however,you might see that sometimes the CPU capacity may get exceeded but that doesn’t mean that you need to upgrade your CPU or to a new computer. Sometimes what happens is many of the applications are very heavy and eats up almost full memory of your pc, some of the examples are photo shop.